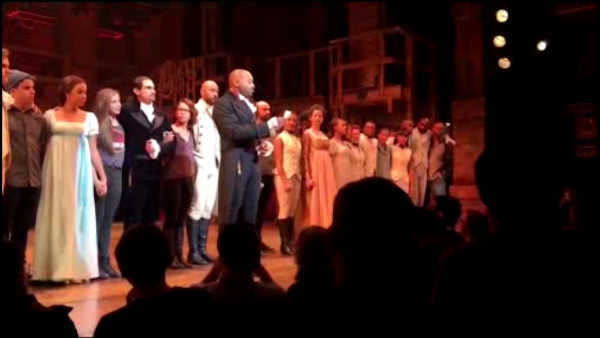 NEW YORK (WABC) -- Amid Hamilton's great success on Broadway, Monday marks the 212th anniversary of the deadly duel between Alexander Hamilton and Vice President Aaron Burr. The two met on the dueling grounds in Weehawken, New Jersey. By some accounts, Hamilton decided the duel was morally wrong and fired into the air. But Burr fired, and struck Hamilton in the stomach. He died the next day. The killing outraged the country and led to Burr's political downfall. An annual gathering will be held Monday at 6 p.m. at the Hamilton Memorial overlooking the Weehawken dueling grounds. Douglas Hamilton, the 5th great-grandson of Alexander Hamilton, will give a speech. Attorney Pooja Nair speaks on the early members of the New York Bar, including Alexander Hamilton, Aaron Burr, and Brockholst Livingston, and the shifting allegiances and interesting connections they shared over the course of their prominent legal careers. This event is hosted in conjunction with the National Archives at New York City, which is home to the original Roll of Attorneys with the signatures of Hamilton, Burr, and others practicing law in the New York City area at the turn of the 19th century. The talk will be held at the National Archives at New York City Learning Center inside the Alexander Hamilton US Custom House, which stands on the site of Ft. George, where Alexander Hamilton was stationed in 1776 as a captain of the New York Artillery Company. See the All Places Hamilton page for Ft. George/Grand Battery. Admission: Free. Reservations in advance recommended - call the National Archives at 866-840-1752 or email newyork.archives@nara.gov to reserve a seat. The theme of this year's gathering is "Celebrating the New Generation of U.S. Currency." Douglas Hamilton, 5th great-grandson of Alexander Hamilton, will again speak at the Hamilton Memorial Bust in Weehawken, NJ a year after his call to action to keep Alexander Hamilton on the $10 bill. The event will reflect on the collective and individual efforts that contributed to the preservation of Alexander Hamilton's place of honor on the next generation of U.S. currency. Following the remembrance gathering, don't miss Thomas Fleming's talk on the Hamilton-Burr duel (see below). This event is co-sponsored by the Weehawken Historical Comission and the Alexander Hamilton Awareness Society. See the All Places Hamilton page on Weehawken Dueling Grounds. --Talk: "Honor: The Key to Understanding Alexander Hamilton's Life - And Death"
Thomas Fleming, author of Duel: Alexander Hamilton, Aaron Burr, And The Future Of America, will be the featured speaker on the 212th anniversary of the Hamilton-Burr duel in Weehawken. This event is co-sponsored by the Weehawken Historical Commission and the Alexander Hamilton Awareness Society. Learn more about Thomas Fleming from his HamilTEN Questions interview. The Museum of American Finance is hosting an hour and a half walking tour through Wall Street Walks to explore the Financial District on foot, with an emphasis on Alexander Hamilton's contributions to financial history. Tickets: $15, which includes admission to the Museum of American Finance and a Lunch and Learn event. Purchase tickets here. Note: Feel free to bring flowers to leave at the gravesite. See the All Places Hamilton page on Trinity Church. Richard Brookhiser, Hamilton scholar, will speak inside Trinity Church and be recognized for his numerous contributions for over two decades for a national understanding of Alexander Hamilton's remarkable legacy. His talk is entitled "Alexander Hamilton, the Man Who Made America Prosperous," and will be followed by an audience Q&A session. Learn more about Richard Brookhiser from his HamilTEN Questions interview. Directly following Richard Broohiser's talk inside Trinity Church, Trinity Archives welcomes attendees to view original documents associated with Alexander Hamilton and Trinity Church in a temporary exhibtion.